Alarm Clock Star Projector, as the name suggested, it has a lot of functions, first of all it, it can be used as a clock, which can display Time, Week, Date, Month, Year and Temperature., it can also be used as a music box, which contains 10 songs, what’s more, it has attractive star light show, once it was turned on, you will have the feeling of sleep in the universe. 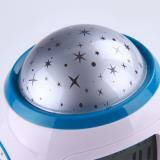 G&T GN-2 Alarm Clock Star Projector, as the name suggested, it has a lot of functions, first of all it, it can be used as a clock, which can display Time, Week, Date, Month, Year and Temperature., it can also be used as a music box, which contains 10 songs, what’s more, it has attractive star light show, once it was turned on, you will have the feeling of sleep in the universe. 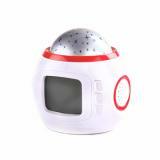 I have bought this Alarm Clock Star Projector at double eleven on sale.Very reasonable price and high quality! Arrived quickly and the pakage is tightly wrapped. There is no damage when I open the box. The Projector performs great. So far so good, my daughter adores this cute device. Looks like a lovely robot, the projector works well. More importantly, my kids love it. Great quality and price. Worth it. Beautiful star light make the room looks beautiful,like it very much! Habe es gekauft weil es so billig war aber Ich bin sehr überrascht über die Qualität, mehrfunktional, attraktiv, mein Kid mag es sehr, cool. Ницца! Синий звездный луч света понравился! 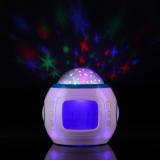 Nice table lamp for kid room or bedroom, to anyone who loves stars. Practical and easy to use, can be used as a clock, a music box, and can also see attractive star light show, amazing, I love it. The light is attractive and the sound quality is good. It has a battery back-up so the clock will stay on during a power outage. The size is suitable, I’m satisfied. I didn't want anything too bright but also not as dark as a night light, this alarm clock star projector gives the perfect amount of lights and looks so cute. I have received this today,undamaged .Small,but beautiful! Hope this alarm can give me a different test. Bought this clock for my 8 year old daughter, it looks so funny as his alarm clock. it's very child user friendly. 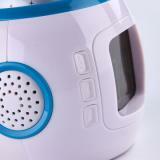 Cute alarm and simplified for children. I use this clock every day and it is perfect, and sound the quality is good. Great customer service also. Я эту лампочку очень сильно люблю ! A birthday gift for my 6 year old daughter...now she gets used to falling in sleep with the star projector on. Creative idea for putting so many functions together. Just the material gives me a cheap feeling. But the price says it. Overall, it do brings some fun for my daughter. Shipping is fast, packing is well, no damage. Gotta buy some batteries to use it. My boy like the design. 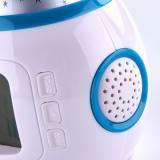 Alarm clock + star projector+music box= a pretty creative gift for children. The price is awesome, but the quality is also amazing! Really good product, nothing was false. It is a gift for my son. Would buy again for my nephew. Bought it for my baby girl. She loves that it has so many functions. The star projector is so beautiful when turned on. Alarm clock function works good, very accurate. More interesting than normal alarm clock. Worth the money!